Labor Day Weekend is supposedly the last official weekend of summer. Ha! It's still hot here, and I mean HOT. However hot it is, my strawberry plants seem to think cooler weather has arrived, as they're producing almost more strawberries than I can use. 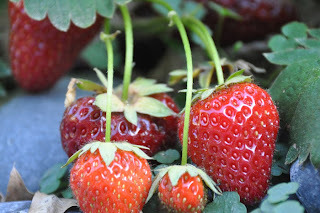 Here's how I use strawberries to cool off when the weather's hot. As an added benefit, if I don't cool off as much as I wish, at least the heat doesn't bother me so much. Directions: Puree strawberries with either an immersion blender or in a blender. Set aside. Squeeze the fresh lemon and lime juices into a second container and set aside. Place the 1/4 cup water in a microwavable container and heat for 1 minute. Stir the sugar into the water until it is dissolved. Add the lemon juice and stir until mixed. Add the strawberry puree, then the cold water, tequila and grand marnier. Stir to combine. Taste, and adjust flavor by adding more water or sugar to your taste. Combine the teaspoon of sugar and the salt on a plate. I used turbinado sugar and freshly ground sea salt because they have big crystals. Wet the rim of two margarita glasses with one of the lime pieces, then roll the rims on the plate to coat them with the sugar and salt mixture. Fill the glasses with cracked ice, then fill with the margarita mixture. Stealthy Cooking Tip: I like the strawberry seeds in my margarita, so I don't strain them out. If you don't like seeing seeds in your drink, you can strain the seeds by pouring the puree through several layers of cheesecloth. Also, if you want to make this without alcohol, simply replace the tequila and grand marnier with 1/2 cup of water. Stealth cooking started out over 30 years ago. I was a vegetarian who married a meat and potatoes man. Over time, I've added small amounts of meat to my veggie diet, and lots of veggies to the meat-based diet. How? By stealthy cooking! Using vegetables when unexpected, changing proportions on the plate, preparing foods in ways that are delicious enough for any palate! Plus, using small amounts of flavorful meats and spices so the taste for meat is fulfilled. I was also concerned about my family's health. My husband had high cholesterol and high blood pressure. The kids were healthy, but I wanted them to stay that way! Initially, no one was excited about eating "healthy". They thought healthy food would taste bad. So, I started out stealthy. I'd sneak healthy tidbits into meals. I'd replace small amounts of foods with healthier choices. Now, 20 years later, many meals are vegetable or grain based. We eat less fat, less salt, less sugar, no transfats, and still enjoy every meal. My husbands cholesterol and blood pressure are in the healthy range. The kids are still in a healthy weight range and live healthy life styles. Amazingly, everyone likes the food! I've been encouraged to share my secrets, and my recipes ... so here they are! Look for stealthy cooking tips at the end of every recipe. All text and images on Stealth Cooking are copyright M. Gilbert 2007-2019. All rights reserved.